Adjustable pallet racking or selective pallet racking is the most common warehouse pallet racking system in use today. It is used for heavy duty palletised goods stored using a forklift truck. Upright frames support horizontal load bearing beams. The pallet is stored by placement on to the beams. Beam levels can be easily adjusted to accommodate various pallet sizes. Standard pallet racking can be used for storage of many items and can also be used as as carpet racking, barrel storage and can be adapted for storage of other heavy duty non-palletised goods. As well as selling new racking, we are suppliers and stockists of used / second hand pallet racking. We have large stocks of most of the major UK and European manufacturers. What type of warehouse storage do I need? If you don’t know what you need to order just call us free from a landline on 0800 612 3210, local rate from a mobile on 0330 660 0321 or e-mail us. We will happily talk you through the different options for used or new pallet racking, hand loaded racking and shelving. If you are working to a budget and need a quality cheap option we specialise in second hand or used pallet racking. Frames – The frame is the complete upright section of the racking. It consists of 2 vertical uprights or ‘legs’ connected together with horizontal and diagonal braces. Beams – The beams are the horizontal bearers that join the frames together. 2 beams create a ‘beam level’ that your pallet/product is stored on. Bays – A bay is 2 frames plus the beams between them. Runs – A run is a continuous line of joined bays. You can see below that in a run of pallet racking the frames (except those at the end of the run) are shared by 2 bays. UDL stands for Uniformly Distributed Load. 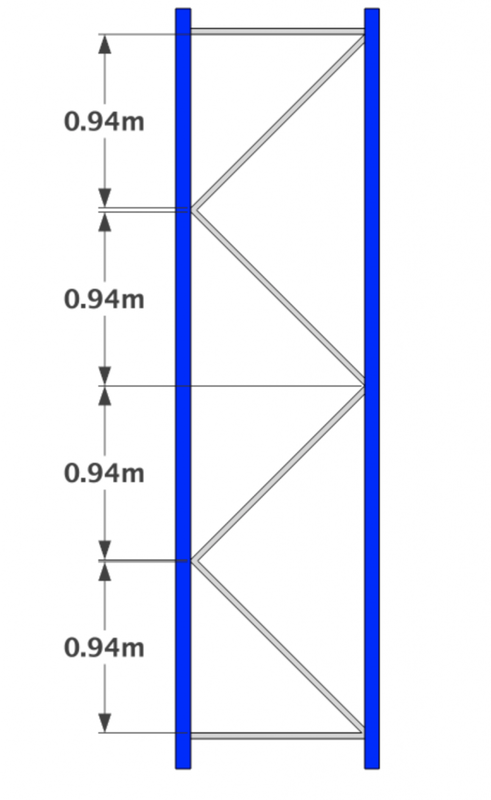 Pallet racking beams may be described as – “2700mm x 2t UDL” this means the beams have a clear entry (see below) of 2700mm and will take a maximum load of 2 tonnes per pair of beams if the load is evenly distributed along the beams. What does Clear Entry mean? The “clear entry” measurement is often used as the length measurement of a pallet racking beam. It is actually the space the beam creates between the upright frames rather than a measurement on the beam itself. How do I measure the upright frames? If your upright frames are too tall to measure easily, you can measure the “triangle” created by the bracing and then multiply it by the number of times it appears in the length of the frame to give an approximate height. For example, the image below shows a 4 metre high frame. What size pallet racking do I need? The dimensions of your pallet racking depend on the type of pallet you are storing. UK pallets are 1200mm x 1000mm and are typically stored on a 900mm deep frame with 2 pallets per 2700mm beam. Euro pallets are 1200mm x 800mm and are typically stored on a 1100mm deep frame with 3 pallets per 2700mm beam. What type of pallet racking do I have? If you need to match an existing system it is essential that we correctly identify what you have as no two racking systems are compatible. Look here for pictures of some major manufacturers brands. If you can’t see what you need just give us a call or send us an enquiry. Do you stock all makes of pallet racking? We always keep very large amounts of all the major manufacturers pallet racking in stock including Dexion Speedlock, Dexion P90, Apex, Link 51, HiLo, Redirack, Polypal, Planned Storage Systems, Mecalux, Stow and AR Systems. If what you’re looking for is not on the list just give us a call or send us an enquiry. Can you provide all types of pallet racking? 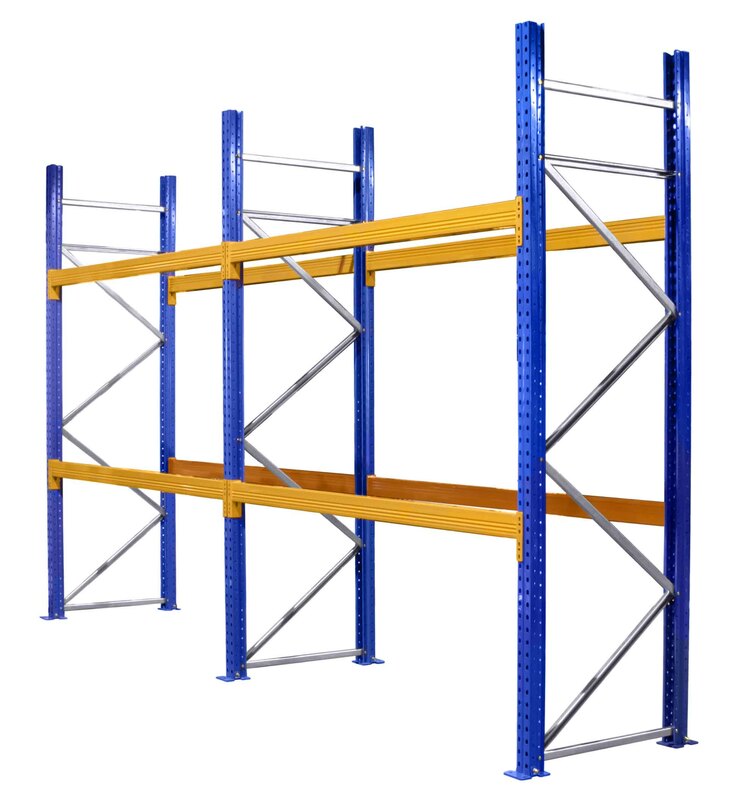 Yes we provide adjustable pallet racking, narrow aisle racking, wide aisle racking, drive in racking, drive through racking, cantilever racking. We will try to provide whatever configuration you need. It is strongly advised that you protect your pallet racking against impact from pallet trucks etc with column guards to protect the frame legs and rack end barriers to protect the end of the runs. We supply standard column guards, corner guards, modular rack end barriers and tubular rack end barriers. We do! We buy large quantities of used pallet racking and are always interested if you have used/second hand pallet racking for sale. Call us and let us know what you have or send us some information here. We can also arrange for the pallet racking to be dismantled and shipped. Yes. We can arrange delivery to any mainland UK postcodes. Yes. We have SEIRS qualified teams available to carry out installations to SEMA guidelines anywhere in the UK. Just ask us for a quote. We have great relationships with many of the leading manufacturers of shelving and racking in the UK, so whatever your storage requirements we are sure we can help. If you have an unusual request or just don’t know where to start give us a call and we will talk you through the options.